My brother, Aaron, always said since he got out of our mother’s womb that “the Kansas City Royals are going to the World Series!” However, for years, Aaron’s declarations were in vain. The great New York Yankees shut out game of 2003. They were Major League Baseball’s laughing stock. Every time that they gained superstar talent such as Carlos Beltran, Johnny Damon, Jermaine Dye, Zack Greinke and James Shields, the Royals Organization would always lose them because they could not afford them. The team’s countless losing seasons. Things began to change when the team hired former Milwaukee Brewers manager Ned Yost in May 2010. After years of struggling, the Royals Organization looked to him and ask him to build a team that would get Kansas City back to the forefront in Major League Baseball. Mr. Yost worked tirelessly with his players, staff and General Manager Dayton Moore to create a team that would be a force to be reckoned with when October came around. Flashback to the Royals’ electric Wild Card and American League Championship Series last year, where the Kansas City Royals bested both the Oakland A’s and Baltimore Orioles in tense games that landed them a spot in the 2014 World Series. This new energy and confidence woke up the Kansas City Royals’ fan base and the entire Kansas City metropolitan area rallied behind their team. Then came the San Francisco Giants! Made up of some of the toughest players the Royals have ever faced including the sly Hunter Pence, Gregor Blanco and then Joe Buck’s favorite son and pitching phenom Madison Bumgarner. Despite every intention and effort by our team, they came up short (90 feet preciously) and the San Francisco Giants won the World Series at Kauffman Stadium. The team did not have time to lick their wounds, as both the players and management came together to create one common goal in the off-season: Get back to the World Series and Take the Crown! After facing the jaws of defeat, the Kansas City Royals spent Spring Training in Surprise, Arizona rebuilding themselves as the Bad Boys of Major League Baseball. The Royals now had a target on their back and were ready to face any team that came their way. The team also overcame the countless family crises, injuries, illnesses, penalties and the reduction of their farm system to earn a spot in the American League Division Series. The 95-67 Royals faced a strong opponent in the form of the Houston Astros. Despite losing games one and three to the Astros, the Royals claimed the series thanks to pitchers Kelvin Herrera, Ryan Madison and Johnny Cueto and to Kendrys Morales, Salvador Perez, Lorenzo Cain Alex Gordon and Eric Hosmer, who all scored home runs during that series. They had one more team to face in order to head back to the World Series: The Toronto Blue Jays! While the Royals won the first two games at Kauffman Stadium, Marcus Stroman, Troy Tulowitzki, Josh Donaldson and Ryan Goins propelled the Blue Jays back into the series with an 8-11 victory over our boys in blue. Then, the Royals led by Luke Hochevar, Chris Young, Ben Zobrist and Alex Rios were able to produce a massive 14-2 victory that gave us a competitive edge in game four of the series. This led to game six back in Kauffman Stadium, where the Royals led by Zobrist, Mike Moustakas, Yordano Ventura and Wade Davis captured the American League Championship once again. 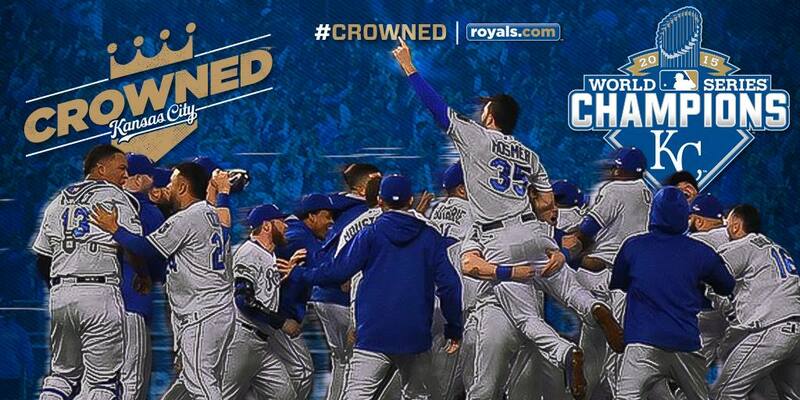 So, how did the Kansas City Royals overcome the New York Mets and won their first World Series in 30 years? They did it as a team! The Kansas City Royals proved that they did not need a superstar player like Bumgarner, Alex Rodriguez, Derek Jeter, David Price or Mike Trout to win a game. Each member of the Royals had the chance to add their hands into their World Series victory. Also, they had strong leadership that included Cain, Gordon, Hosmer, Moustakas and MVP Salvador Perez, who were at the forefront guiding the team to victory. Also, they did not rely on home runs…but on singles and using a conga line to get players back to home plate. That strategy came in handy during last night’s amazing 12th inning. Thank you for making history once again!